Take two megalomaniacs with a fine sense of the theatrical and diabolical, then sit back to enjoy the mayhem. You can listen to this one without having heard the previous two in the Master trilogy (And You Will Obey Me and Vampire of the Mind), which are each stand-alone. However, this audio does tie off some subtle loose ends from the previous two installments. It’s a very clever bit of plotting which provides an in character justification to satisfy our wish to see what would happen if MacQueen!Master and Crispy!Master collide. Of course, the result is a Logopolis-sized problem: the universe is unraveling again. But is it the Masters’ fault, or some third party? Either way, the Doctor’s going to have to work with them while simultaneously trying to thwart them. Doctor: Will you stop killing them!? Master: But I’m so good at it. You save people; I murder them. It’s what we do! It’s a good thing the Seventh Doctor is in this story, because there’s a metric ton of scheming and double-crossing. He’s about the only one who could hold his own in that regard. The plot’s complicated enough that I lost it in Part III and had to listen to it again, but I think that was due to my being fuzzy-headed from the flu rather than anything wrong with the story. Beevers and MacQueen both have tour de force acting parts, thanks to a great script that lets them stretch their wings. Beevers had me laughing aloud; he’s so evil, so horrible, yet surprisingly funny on this outing! I’m not as familiar with MacQueen’s Master, but he’s doing something surprising in this story as well. There’s also a fascinating reveal for the Master’s backstory which I really liked; it answers a question I’ve had for years. Jemima, whom the Seventh Doctor takes under his wing, is a convincing companion, but she doesn’t get to do much beyond ask sarcastic questions to facilitate exposition. The Seventh Doctor is occasionally upstaged by Crispy!Master, but he holds his own in a story that has to give major roles to his adversaries. The only quibble with The Two Masters is that Parts I and II are more lively and engaging than Part III and especially IV. The final episode drags a bit. Also, there’s a touch of “reset button” syndrome. However, there’s also some admirable “kettle and a ball of string” cleverness on the Doctor’s part, in which he beats some pretty abysmal odds with his wits. The fun banter between the Two Masters more than compensates for minor handwaving. FYI: Both the Doctor and Master spoil the ending of The Rocket Men in passing. (At least, I assume so. They mention what happened the last time the Doctor encountered them, but I haven’t heard that audio yet). I love the way the Masters pass judgment on their own past incarnations and the Doctor’s. “The drippy blonde one, dresses like nobody who ever played cricket ever” indeed! I noticed at one point that MacQueen sounded rather like Beevers, but I somehow didn’t put two and two together, even though I also noticed how Crispy!Master was acting positively giddyI realised there was something different about him, but I remembered the interviews after And You Will Obey Me, in which Beevers remarked how different authors wrote his character a little differently. So I wrote off the discrepancies almost until the reveal (I think I finally figured it out about the time the Doctor was tricked into murdering a bunch of rock people). It will be interesting to listen to the previous two stories again, now that I know more about both Masters. I’m a little disappointed, though, that Crispy!Master’s odd relationship with the children in And You Will Obey Me turns out to be MacQueen’s Master instead. It’s such a good story that I forgive it, but I’m boggling at the scale of the reset button at the end. It’s audacious to claim that our entire universe is a remake of an older model, which was completely destroyed. It’s a fascinating but outlandish proposition to suggest one can use Time Lord biodata to regenerate the entire universe! I suppose that’s no more implausible than suggesting it was originally vented out of a spacecraft’s faulty engine (Terminus). Sebastian (not Grayle!) is an interesting villain. I wasn’t quite sure about having him outsmart both Masters in a story where they’re really the stars, but it did set the tale in motion, and they do get their comeuppance against him sooner or later. The Seventh Doctor seems to have far less concern about the Web of Time than his next incarnation does. First, Seven blithely destroys the flagship in order to change the battle’s outcome and the war. How many thousands of lives did he save doing that? And some of them may have been more important than a cabin boy stowaway on the R-101. Speaking of cabin boys, the Doctor succumbs to the lure of the reset button enough to make sure Jemima lives. He doesn’t agonise it the way Eight would do with Charley. 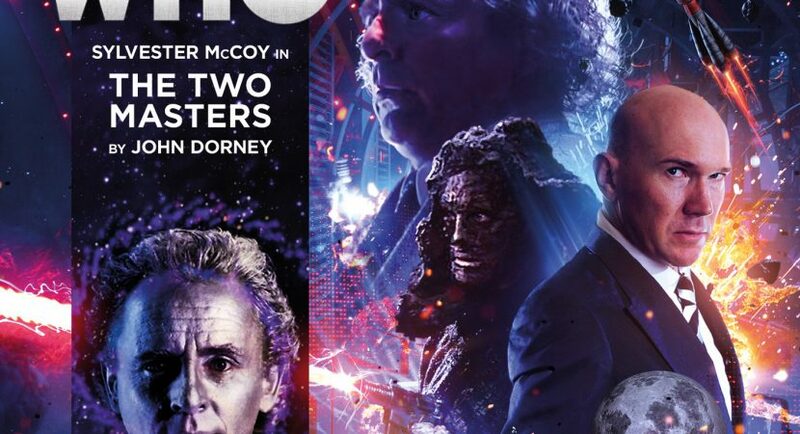 The Masters’ timelines are complicated, but we glimpse Crispy!Master before he was crispy, so it’s back during the Fourth Doctor era for him, while MacQueen!Master doesn’t remember the Seventh Doctor, although that may be due to the gaps in time rather than this being their first encounter. Seven certainly knows him. For the Seventh Doctor, this is probably quite late in his run. He’s traveling solo, almost certainly after Ace’s departure. Main Range 39 – Bang-Bang-a-Boom!